Located in the heart of San Francisco’s financial district, the Mechanics’ Institute is a nonprofit membership organization open to the public. Founded just after the Gold Rush to provide technical education and training for mechanics and to promote local and California industry, the Institute today is a vibrant intellectual and cultural center serving the entire Bay Area. 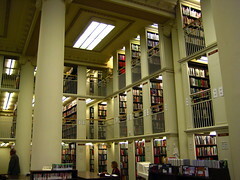 Housed in an one hundred year-old landmark building on Post Street, the Institute serves its members with a large general-interest circulating and research library, offering book discussion groups, writers’ groups, and Internet research classes; the oldest chess club in the United States with activities for players of all abilities from beginners to grand masters; and an active program of literary and cultural events, including author programs, film series, salons, special events and art exhibitions. Source: Mechanics’ Institute. 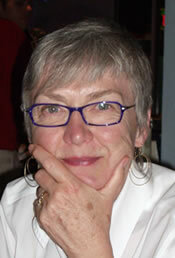 BayNet speaks with Sharon Miller who is the Institute’s acting library director and BayNet’s newest Treasurer. What is one thing your library is very good at? Personalized customer service. We take pride in meeting our members’ information needs. Is there something else about your library that most people do not know? We are a full-spectrum library, no longer training men in the mechanical arts. Who are your most frequent types of users? We have no one category, but daily see students, retirees, workers from surrounding retail and businesses, and children who are chess players. What do you like best about your users? They all like our library! As a library director, what are your primary responsibilities? I manage the budget and the personnel, oversee several book groups and writers’ groups, teach classes, give tours, and promote new projects. We are busy with technology upgrades and marketing ideas, and am always looking for ways to make our facilities more useful for our library users, so I enjoy talking with people. I love listening to the ideas presented by our enthusiastic members! What is it about your job that most people don’t realize that you do? Fix photocopier problems. What initially attracted you to library work? I wanted to spend my days in a library. My family were enthusiastic public library users from my infancy. What do you like most about working in your library? Our book discussion groups are fun, entertaining, and usually a wonderful learning experience for all of us. What is most challenging about working in your library? Convincing people the Google is not always the best place to find information. What accomplishment at work are you most proud of? Teaching people who have never used a computer how to do so, and seeing them successfully using email and other computer applications. What is the most memorable experience you had at work? One of my everyday joys on the job is the physical place where I work: an historical building that is both charming and majestic. It is a delight to walk in every morning. What is your favorite way to spend time off? My husband and I spend our weekends walking all over the city: doing errands (we have no car), seeing the sights, and enjoying this terrific place. What do you think will be the biggest change in libraries and information services in the future? Changing the way reference librarians have traditionally interacted with people: rather than waiting for people to come to us, we will be finding ways to “push” information out. Libraries will be less of a “place” — although that will always be one part of who we are — and more of a service.